Debating has been a popular feature of extra-curricular activities in Maynooth Education Campus for the last number of years. Before that, there was a long-lasting tradition of debating in the school so it is wonderful to see such a surge in interest. Debating provides students with skills that will last their entire life. It encourages students to discuss, defend and decide their opinions on specific topics and challenges them to think outside of the box! There are two main teams for debating in MEC, the Junior Team and the Senior Team. The Junior Team are taking part in multiple competitions each year, in teams of two. The Senior Team are focused on the Concern Debates programme. 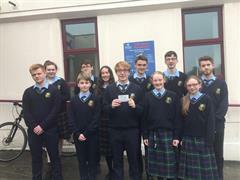 The students had great success last year, with one Junior student progressing to the final of the Aoife Begley Debating Competition in Maynooth University. Debating provides a lot of opportunity for students to develop their academic writing, but outside of academics, it is an excellent place to make new friends, to grow in confidence and happiness. If you are interested in joining debating, contact Ms. Fagan in school and listen out for sign-up information!